ORANGE, July 15 – Seymour scored six runs on six Mystic/Groton errors in the bottom of the fifth to claim its second straight state championship with a 10-2 victory in game three. Five of the six runs in the fifth inning were scored with two outs. The game was called with two outs in the fifth inning due to heavy rain and lightning. P. Megan Condo shut down Mystic in the final two innings, allowing just one hit. At the plate, Condo had a double and triple. Sierra Cripps had a home run. The game began Monday and was suspended due to lightning and heavy rain with Seymour leading 2-1 in the bottom of the second inning. ORANGE, July 13 – Karly Morales’ two-out single in the bottom of the seventh inning drove in Megan Giwoyna from third base to lift Mystic/Groton to a 1-0 win over Seymour Sunday at Stankeye Field. The win ties the best-of-three championship series at 1-1. Giwoyna led off the seventh with a single and moved to second on a sacrifice bunt from Nora Ryan. An infield single from Aspen Ryan moved Giowoyna to third base. Seymour P Molly Adamo limited Mystic/Groton to just five hits. Mystic/Groton P Allison Georgetti allowed three hits. Mystic threw out a Seymour runner trying to steal home in the third inning. 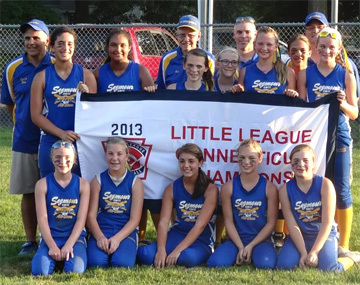 ORANGE, July 12 – Jill Andes scored from third base with two outs in the top of the sixth inning as defending champion Seymour won the opener in the best-of-3 state championship series Saturday night at Stankye Field. Andes reached first base with a bunt and moved to third base on a sacrifice bunt from Kolby Sirowich. She never stopped running rounding second base and beat the tag at third base. Seymour P Megan Condo struck out five and allowed two hits. Mystic P Aspen Ryan allowed just two hits and struck out three. ORANGE, July 27 – Seymour had a double and took advantage of two walks and an error to score seven runs in the second inning and sweep the best-of-3 state championship series with a 7-3 victory. Emily Nelson and Erin Craig had RBI singles for Pawcatuck. Seymour’s Craig, Nelson, Lennon and Beverly each had two hits. It was the first Junior Division state title for Seymour. ORANGE, July 26 – Seymour P Jenna Geffert gave up a hit with two outs in the fifth inning as Seymour grabbed a 1-0 series lead. She walked one and struck out seven. Rebecca Findley had an RBI single in the first inning while Tori Kellogg had a two-RBI single in the second inning. 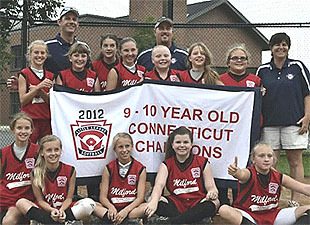 PLAINFIELD, July 21 – Plainfield/Moosup erased a two-run deficit and beat Stafford, 10-5 to win the state championship. Reese Griffin had a two-run, inside the park home run in the third inning that put Plainfield (5-0) ahead for good. Haley Grimshaw had an RBI single to push the lead to 5-2. In the fourth inning, Plainfield added four more runs including two after a two-RBI single from Tess Marandola. Wallingford (D5) will represent the state in the Eastern Regionals for the third straight year. ROCKY HILL, July 19 – P Kylee Holderied allowed only three hits and struck out 21 in three state tournament games as Fairfield rolled to its fourth state championship. She struck out eight in the championship game. Fairfield didn’t give up a run in three state tournament games and made just one error. It was Fairfield's first state title since 2009. After a pair of one-run ballgames, North Branford outlasted Madison/Clinton to win their second state title and their first since 2011. HARWINTON, July 27 – Fairfield American scored eight runs on four hits, four walks and an error in the third inning to sweep South Windsor National, 12-2 in four innings and win the state title for the fourth time in five years. Fairfield American (12-1) scored 12 unanswered runs. Jamie Flink hit his eighth HR of the summer, a three-RBI shot. Ian Bentley had a two-RBI single for the winners. Pitcher P.J. Egan earned the win, scattering six hits and two walks. HARWINTON, July 26 – P Sam Davenport struck out six and allowed just two hits as Fairfield American won game 1 of the state championship series in five innings. Fairfield (11-1) had 10 hits and took advantage of five South Windsor errors. Seven of the 10 runs were unearned. Jamie Flink, Ian Bentley and Brian Howell each had doubles for Fairfield. Norwalk (D1) 8, Annex (D4) 6. CLINTON, July 26 – Edgewood Grey swept Jewett City to win the state championship. Edgewood swept the best-of-3 series with a 9-2 win in game one. Edgewood had so many players at the junior level that they asked for and received a waiver to enter two teams in the District 5 tournament. Edgewood Grey won the D5 title and Section I title. BRISTOL, July 21 – Eight players had two hits or more to lead Edgewood to an easy win in the state championship game. Joey Dorsio had a triple, two singles, and three RBI to lead Edgewood while Evan McGinley had three hits. Zack Marquis had two doubles and two RBI and Jaeden Rasmus had two hits, a sacrifice fly and three RBI. Rasmus pitched a five inning no-hitter, striking out nine. Edgewood has won four straight state titles in the Senior Division. SOUTHINGTON, July 28 – Brandon Buda and Ryan Teixeira had home runs in the fifth inning to lift Trumbull Americans to a 5-2 win over Ellington in the decisive third game of the Minor Division state championship series. Teixeira hit two home runs in the game. Tied at 2-2 in the fifth inning, Ray Leonzi doubled and scored on Buda’s two-run home run. Teixeira followed with a solo shot for a three-run lead. Leonzi finished with three hits, including two doubles. 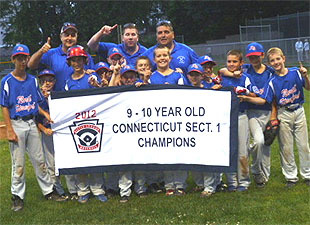 It was Trumbull's first Minor Division title. They finished second in 2008. SOUTHINGTON, July 27 – Ellington pushed two runs across in the fourth inning before the game was called after a 90 minute delay due to rain and lightning. SOUTHINGTON, July 26 – After five scoreless innings, Trumbull scored five in the sixth inning to outlast Ellington in game 1 of the best-of-3 state championship series. Ryan Teixeria had a three-run homer to give Trumbull a 4-0 lead. A RBI single by Robert Goldstein made it 5-0. ELLINGTON, July 28 -- Mystic won the final two games of the state championship series to win their first-ever 9-10 division state title. Timmy Lynch had two hits and scored three runs. Jason Erb had two RBI while P Cam McGugan had a triple. ELLINGTON, July 27 -- Timmy Lynch drove in Colin Starz with a base hit in the bottom of the sixth to tie the game at 8-8. Lynch scored the winning run on an error to give Mystic the victory. Ties are broken based on records in head-to-head competition among tied teams. In the event of a three-way tie, the initial tie is broken based on fewest runs allowed per defensive inning played. The tie between the remaining two teams is then broken based on head-to-head record.